For us at CmdStore, Batman isn’t just some dude with a cape and rippling muscles — he’s a hero, a legend and an inspiration. Millions of people have followed Christopher Nolan’s saga featuring protagonist Bruce Wayne, and he has since become an icon of peace and heroism. So it’s only natural that we take a moment, grab a beverage (and maybe something cozy to wrap around ourselves) and reflect on one of Batman’s less-publicized roles: that of a teacher. 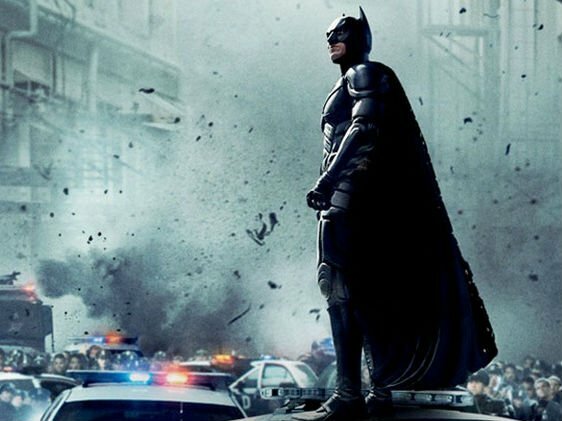 So let’s check out these seven essential things we can learn from Batman as he appears in the Dark Knight trilogy, culled from Nishant Singh’s thoughts over at Quora. 1. It’s what you do that matters. Christopher Nolan’s Batman is tasked with leading a life based on a destiny that he didn’t completely choose. Yet in many ways, he still takes it in stride, fulfilling his duties with grace and to completion. He teaches us to not waste any time when you’re needed, to speak out when it’s called of you because you might be the only one who can do it. 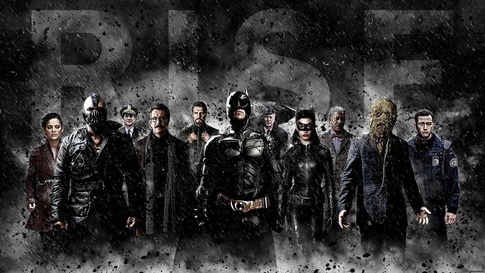 The world needs you, says Batman, and it’s time that we agree. So we shouldn’t waste any more time, should we? Maybe tell that person how we feel, go for that jog even though we’d rather eat a burger and watch TV, apply for that job we keep telling ourselves we can’t get. What matters is that we at least try by doing. 2. Trust yourself and those around you with the truth. When Batman’s request to take the fall for Harvey Dent’s murders as Two Face comes to light, it’s apparent that despite attempts to make sure the citizens of Gotham did not lose their belief in the law and in justice, crime was still a problem. It didn’t disappear, but was just pushed aside and eventually resurfaced to do even more damage to the city, says Singh. Lesson learned — honesty is always the best policy. Bite the bullet and be brave enough to be truthful to those around you, even if it might be uncomfortable at first. Trust is everything. 3. Great organizations are built upon great ideas, not people. Bruce realized the importance of transcending his human ego and choosing not to be defined by his person, but by what the figure of Batman embodied as an idea. It’s a hugely important theme of the entire trilogy that’s applicable to the lives we live every single day. Think of the many organizations, institutions, conglomerates and communities formed purely on ego. And then think of how many of those have come to signal something transcendent and lasting for humanity. I mean, who can definitively say that the Kardashians will be lauded for their contributions to human progress centuries from now? It’s the big picture and the drive towards the greater good for us Earth-dwellers now and into the future that really matters. This is why the Marin Luther King, Jr.s, Angela Davises, Mahatma Gandhis and Marie Curies have been so key to moving us forward — they had ideas, simple yet radical, that they chose to advance above all else, and that they chose to put before themselves. 4. Struggle is inevitable, so struggle for the right reasons. It’s definitely much easier said than done, but choosing to fight for a good thing even if it’s hard will pay off in time. All pain is temporary. Which leads us to our fifth lesson . . .
5. Like struggle, fear and pain are also inevitable. 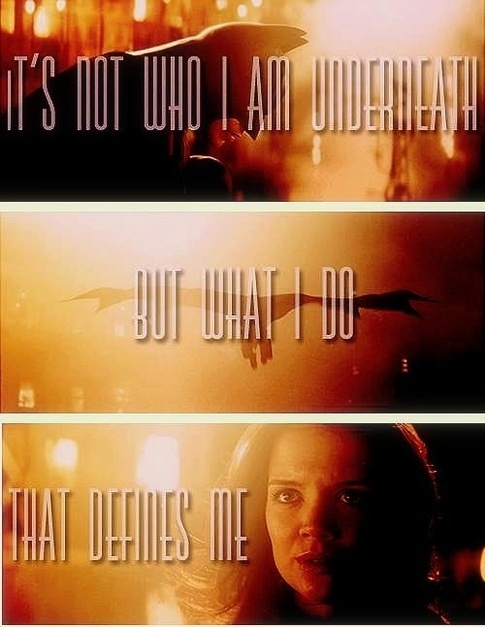 Batman struggled immensely after losing Rachel Dawes, and part of the pain he felt was compounded by the fear he had of losing her due to his own failure. Yet, he was compelled to carry on, moving through his sadness and loss in order to keep fighting for the freedom of Gotham City. And in doing that, he foiled the desires of his enemies, who wished for nothing more than for Batman to be rendered incapacitated by grief and therefore useless when it came to ushering in a new age of peace for Gotham. As Thomas Wayne quipped, “Why do we fall, Bruce? 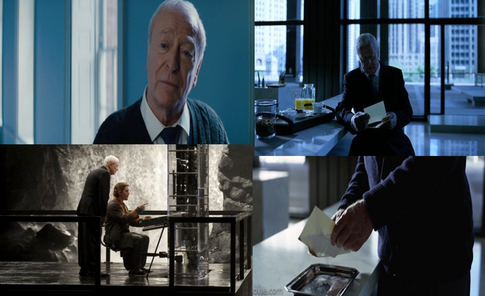 So we can learn to pick ourselves up.” Whether Bruce “failed” by being unable to rescue Rachel, by being cooped up in a terrible prison or by leading the people of Gotham to believe that Harvey Dent was a hero, he learned from his failures, worked through his pain and shame and rose again as the savior the city needed. 6. It takes great risks to achieve high goals. And they’re worth it. “Then make the climb,” admonishes the blind prisoner. And when Batman asks how, the prisoner responds, “As the child did. Without the rope. Then fear will find you again.”What this means is that success will come with more than a few setbacks. But often our most obstructive inhibitors to success are inside us, taunting us like the open top on the prison Batman is trapped in. Seeing that light and not being able to grasp it right away had deterred many an otherwise hopeful escapee. 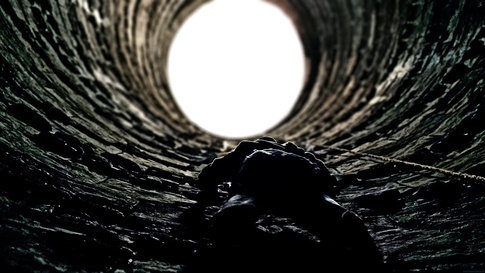 It is only when Batman risks absolutely everything and climbs towards the top without anything to catch him should he fall that he is able to escape and finally free Gotham. To bring it back to real life, sure, maybe the prospect of no one showing up to your birthday party is totally mortifying. But what if it could have been the best night of your life, and you didn’t even try to piñata-shop at least once? What about starting that business or taking time off from your regular life to hitchhike across the continent, like you dreamed when you were a kid? What about seeking help for anxiety or depression, an incredibly courageous act in itself? The time is now, and this time, everything is demanded of you. Can you do it? 7. Anyone can be a hero. Supervillain Bane is a relatively new character in the DC universe, introduced by the comics franchise as late as 1993. He’s an escaped convict from an island prison somewhere in South America, and is known for his amped-up and muscular appearance that came from some dastardly experimentation with the drug Venom. And now, from the much-loved video game experience Batman: Arkham Origins comes this eight-inch offering in the form of masked supervillain Bane. Due to popular demand, we’ve restocked him just for you! This version of Bane is based on his aesthetic as seen before the events of the preceding games Batman: Arkham Asylum and Batman: Arkham City. After all, who else could be perpetually haunted by the “bat-demon” of his nightmares? Own this cryptic, fascinating character today! Inspired by the designs from the Batman: Arkham Origins video game, this new figure of Bane is done very well by DC Direct. Batman Arkham Origins 6 Inch Action Figure Series 1 – Set of 4 (Batman, Black Mask, Joker, Bane). 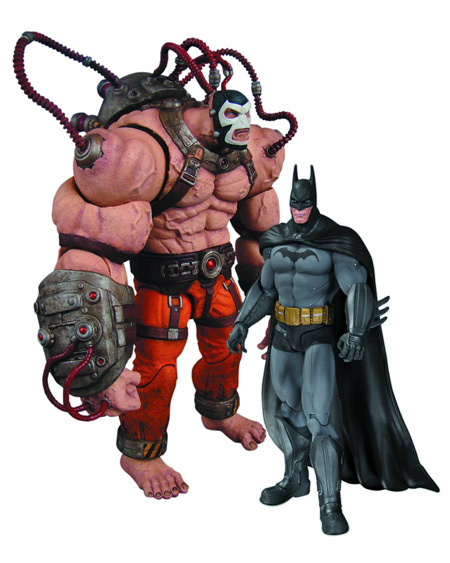 Re-enact the epic battle between the Bat and Bane in your very own home with this special 2-pack collection of the Dark Knight and the venom-fueled villain based on their appearance in the critically acclaimed video game Batman: Arkham City. Standing an impressive 10 inches tall, this Play Arts KAI action figure of The Dark Knight Rises’ BANE is one of the best figures to join the line and a great addition to any Bat-fan’s collection. He’s a Japanese import and a brilliant figure. Beyond that, he also features an alternate set of hands, a variety of weapons and a display stand. He’s packaged in a window box for display by those who like to see their figures, but keep them safe from the horrors of dust. Kelley Jones’ take on BANE is a brilliant, exaggerated take on the muscle-bound supervillain. Hopped up on venom, he’s the latest addition to the Batman: Black and White series and pays a fitting tribute to a villain whose recent incarnations in both film and comic book pages have been incredibly strong and incredibly memorable. Statue measures approximately 8.75” high x 7” wide x 5” deep.